As the budget cycle begins, analysts from the City’s Finance Division publish reviews of the budgets submitted by every department and agency. These will eventually show up on the City’s general “budget” website, but most of them are now part of the agenda for the Budget Committee’s meeting of January 5, 2016. This article reviews the notes for the TTC’s Operating and Capital budgets. All illustrations within this article are clickable for a larger version. This chart shows how the total budget, fares and subsidies interact. Although the gross expenditure for the conventional system goes up 2.5%, the subsidy goes up by 4.5% because revenues do not keep pace. There is always a tug of war between providing more service to handle both growth and political promises, while keeping fares down, again for political reasons. Council can hardly complain that the subsidy grows well above the inflation rate under these circumstances. For Wheel-Trans, the growth of the subsidy is dictated almost entirely by the growth in costs because so little farebox revenue comes from that service. Ridership is growing thanks to eligibility changes and increased service, while fares grow by only a small amount. On the conventional system, ridership has not been growing at the expected rate not just in 2015 but for a few years previous. The routine claim from TTC is that this is due to bad weather in early 2015, but this does not explain the ongoing shortfall in previous years, nor the fact that ridership continues to run below budget into the fall of 2015 when the weather, if anything, has been quite balmy. Since 2013, actual ridership has been below budget, and the 552-million figure for 2016 shown here will be a challenging target to meet. The TTC is funded primarily by fares, with much of the remainder coming from subsidies. An outstanding issue for the City is that the TTC does not have “Service Standards” for its departments. These should not be confused with the standards applied to service design (crowding, maximum headways, etc.). These values the City seeks relate to departmental performance, and it is difficult to say just how meaningful such standards would be and how closely they would relate to the actual “service” the organization provides to riders. The Preliminary Budget included here is not the same as the TTC’s version because it omits $18.4-million in various TTC-approved improvements for 2016. Note that “Earlier Sunday Transit Service” applies to the surface network, primarily bus lines, where many routes do not now begin service until 9:00 am. Although earlier rapid transit service on all routes will begin at about 8:00 am effective January 3, 2016, the feeder surface routes will not see earlier service until later in 2016, and assuming that this budget line is approved at Council (or the TTC takes some other action to fund the service without affecting the subsidy level). The POP Fare Inspection is a particularly amusing item because Proof of Payment and All Door Boarding were implemented with great fanfare by the TTC on its streetcar system quite recently. However, Council might well not approve funding of the Fare Inspectors the TTC requires. Garage leasing: To accommodate a “hump” in total bus fleet requirements that will last until new rapid transit lines replace bus services in the early 2020s, the TTC will lease a “temporary” garage at an annual cost of $25-million starting with the 2017 budget. This is a net new operating cost to which must also be added the cost of staffing and maintaining the new garage. Presto fare card: The cost in fare handling fees to the TTC from Presto is estimated to grow to over $50m in 2017. The TTC has not yet identified offsetting savings from the reduced scope of existing fare collection systems. The Analyst notes recommend that Council require the TTC to report to Executive Committee by June 2016 on the savings that will be used to offset Presto costs. Wheel-Trans costs are projected to rise at well above inflation due to demographic changes and increased eligibility. The additional cost of operating the subway system once the TYSSE opens to Vaughan (net of new revenue) is projected to be $11m in 2017 (startup and commissioning) and a further $20m in 2018 for an annual added cost of $31m. Further “significant funding increases” will be required for operation of the LRT lines and the Scarborough Subway, and there is “currently no funding strategy in place” to address them. Another way of looking at this is that before Toronto even manages to spend any new money it might find to support improve transit service, it must deal with a backlog of unavoidable demands on the operating budget. 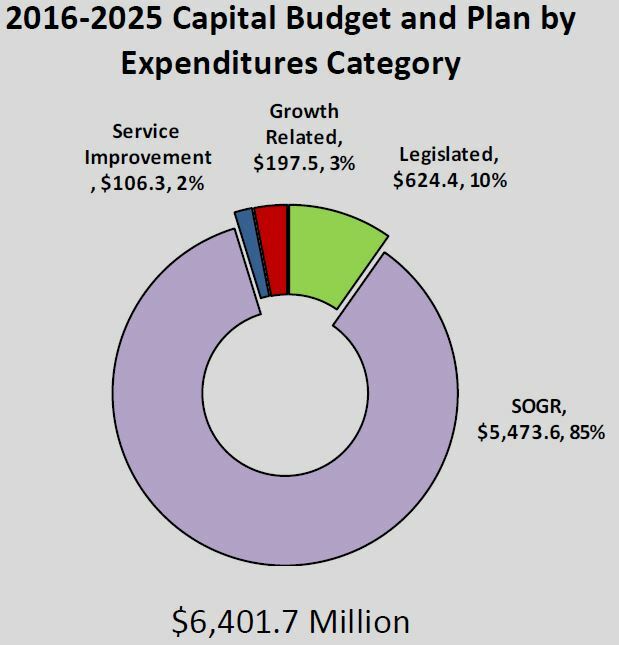 The Ten Year Capital Plan for 2016-25 includes just over $6-billion in proposed spending. As discussed in a previous article, this is nowhere near the total of the TTC’s capital needs, but stays within the City’s “affordability” target. The budget is subdivided by type of work with “State of Good Repair” consuming the lion’s share. Assignment of some projects to these categories can be misleading because some projects address more than one area. For example, a project to increase subway car storage capacity for the TR trains is booked as “SOGR” although, in part, this is a cost related to system expansion. Similarly, part of new fleet costs are related to replacement of old vehicles, and some to system growth. By contrast, the cost of McNicoll Garage is divided equally between “SOGR” and growth [see p2 for details], while Presto costs related to new fare gates are booked against “growth” when they are really “SOGR” and “legislated” because they address accessibility at automated subway entrances. Over 75% of the funding for this plan comes from Provincial and Federal subsidies, and from City debt or capital-from-current spending. Of the subsidy moneys, only about $230m ($160m from Ottawa and $70m from Ontario) comes from Gas Tax and is not tied to any specific project. On a long-range basis, the subsidy will fall based on current commitments placing great pressure on the City’s own ability to raise capital. Development Charges are mentioned from time to time as a funding source, but as they now provide less than 10% of the total (and that for an underfunded plan), the ability of DCs to offset much of the shortfall is limited. “Other Revenue” is primarily money from Waterfront Toronto’s budget for projects that they are funding such as the Queens Quay rebuild and Union Station second platform. There remains almost $3-billion in projects that the TTC has approved in principle, but for which there is no funding, and another $5.5b worth of projects that have not even made it into the 10-year plan. Some Capital spending planned for 2015 has moved into future years, and 2016 now has the peak spending rate. Easier Access Program: full accessibility to subway stations is now funded for completion by 2024. This project was formerly “below the line”. “Finishes” which includes roof rehabilitation and station modernization costs. Spending of less than $400m/year cannot sustain a $9b 10-year plan. The constrained rate of capital spending brings a growing backlog of unfunded “SOGR” work. Such a backlog cannot be allowed to accumulate forever, and one must wonder what sort of catastrophe will be required to wake up City Council and other potential funders analogous to the Russell Hill subway disaster in 1995. With all the claims that the TTC is focussed on an improved experience for its riders, taking pride in restoring the system to its former premier status, the underfunding is an uncomfortable reminder of what has happened before. The replacement of the T1 subway car fleet (which operates on the BD line) first appears in 2018 with early contract payments. The Analyst notes that the T1s will be reaching the end of their life in 2025. This timing is also related to the resignalling of the BD line and conversion to Automatic Train Control which the T1s cannot use, and the existing signals cannot be decommissioned until the T1 fleet is retired. A program to overhaul Hybrid Buses in 2019-25 has been moved below the line. The TTC has already planned to retire the oldest of its Hybrids rather than trying to keep them in operation, but treating maintenance of those remaining in service as unfunded begs the question of which buses will be available to provide service when these fail. A plan to buy 99 additional buses to improve loading standards has been placed below the line. Fire ventillation upgrades ($1.5b): This is not a legislatively mandated program except at sites where construction triggers a need to meet the current building code. Yonge-Bloor capacity improvements ($1.1b): This project dates back to the era before the TTC accepted the need for and benefit of a “Relief Line”. If Metrolinx demand projections are to be believed, the future demand at this junction could be reduced substantially. This begs the question of exactly what “capacity improvements” are really needed, and whether savings in this project can be used to offset the Relief Line’s cost. Waterfront ($1.1b): This project is described as being for the West Donlands LRT and four vehicles for the Bremner LRT. These lie beyond the timeframe of the East Bayfront LRT which is not included in the TTC’s list presumably because Waterfront Toronto is expected to pick up the tab. Notable by its absence here is the Relief Line itself which, by virtue of its distant commencement date (if ever), is not within the plan’s 10-year scope. A provision for $150m in additional costs to complete the project. A loss of hoped-for investment income from the Move Ontario Trust (which held Provincial subsidy monies for the project) of $85m as the trust was unable to achieve a 4% rate of return. This has been partly offset by redirection of surplus funding from TTC’s 2015 operations. A loss of hoped-for Tax Increment Financing because the Ontario government has not passed an enabling regulation. This has been offset by a draw on the City’s Strategic Infrastructure Reserve. The Scarborough Subway Extension (SSE) will be funded from a number of sources including Federal and Provincial commitments. It is unclear whether these funds are “net new” or whether they represent a draw against programs such as the planned new Federal Infrastructure Program. If the latter, this will reduce the amount available to Toronto from this “pot” for other capital programs. I am guessing that the reason SOGR is so overused is that TTC planners figure if they list it as SOGR, it will get funded “as it must be critical to the safe operation of the system”. A small committee of three (TTC Safety Supervisor, A civilian member of the Board, and a senior City Budget staffer) apply a “test” to the classification of budget items – if you need it to make the existing system work right = SOGR; if they must do the work to meet code = Legislated; anything to make the existing system work better, faster, or more economically is an Improvement, and Growth makes the existing system bigger. “Test” reasoning for classifying each project should be appendix A – no loop holes! This would then give the Board a bottom line position – “if we don’t fund SOGR the system becomes unsafe”, same principle applies to legislated improvements = it leaves no wiggle room. Obviously the “improvements and Growth” areas become the political “footballs” where the pet projects get kicked about. But this is how it should be set up. This ensures that the system runs safely – not well. And when the public starts to whine, will make the Board and their political masters accountable as they should be. I think the POP Fare Inspection line item is made to look bad. There should be some revenue associated with having more fare inspectors (either directly through fines or indirectly through higher fare box recovery rates). If it’s a 0.14% impact (1 in 711 now paying a fare or 1 in 107,849 now paying a fine), then the line item is cost neutral. I don’t expect it to be that high, but there should be some positive associated with it. The Operating shortfall that’s been pushed back to 2017 is scary. 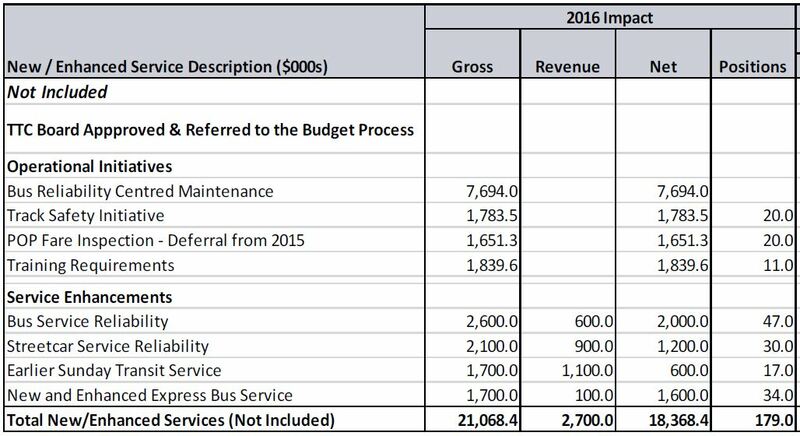 From the four bullet points that Steve lists plus nominal increase in bus costs will put the subsidy increase in the range of $100M (25%). That’s not something that can be dealt with by modest fare hikes. With all the other various budget pressures is seems like 2017 is the end of the road that we’ve been kicking the can down, but knowing Council, they’ll find an alleyway. We need a one-time large adjustment to taxes, something on the lines of a 12.5% one-year hike. That’s just a gut figure. The alternative is to move away from the “constant tax collection” method and only adjust the mill rate directly: i.e. if 2001 were 0.015% then 2002 at 0.0145% would represent a tax rebate, not a hike. Housing prices and mortgages have soared in Toronto, so proportionally property taxes are a shrinking portion of annual expenses. It also would serve as a slight brake on the overheating market. The Capital Plan is more deceptive. They need to add a few lines showing what a few of their major expansion projects would do to the future plan (SSE, ST, DRL). Really, we’re just looking at the face of the mountain and hoping the other side is a decline and not a plateau. 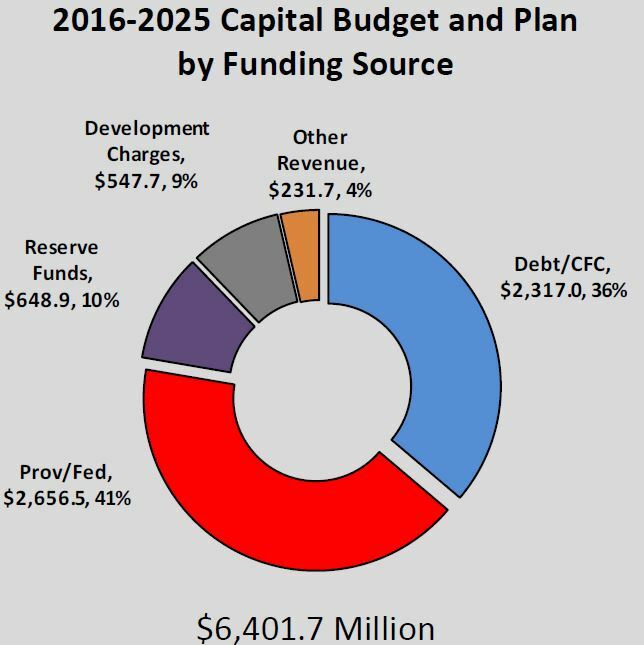 Also, the need for City debt for the Capital Plan needs to be shown in contrast to the Debt Ceiling. That the bus heavy rebuild and replacement programs have fallen below the line is a very worrying sign. It shows that there is no objective ranking of projects (scale, net cost, service impact). Without such information how can the Capital Plan be anything more than SOGR plus political pet projects? The SSE numbers are very strange. There seems to be little to no adjustment to the SSE numbers for the project slipping into the future (at a minimum a higher tendering/mobilization cost for a swift deployment plus allowances for the design mistakes that will slip through). In addition, the old estimate for future construction cost inflation should be revised according to real conditions (for example, are these based on 2015 dollars?). While the current study isn’t finalized, they should have some input into what the actual costs are going to be. Otherwise, this funding mess will be pushed into the 2017 cycle that’s already crowded. 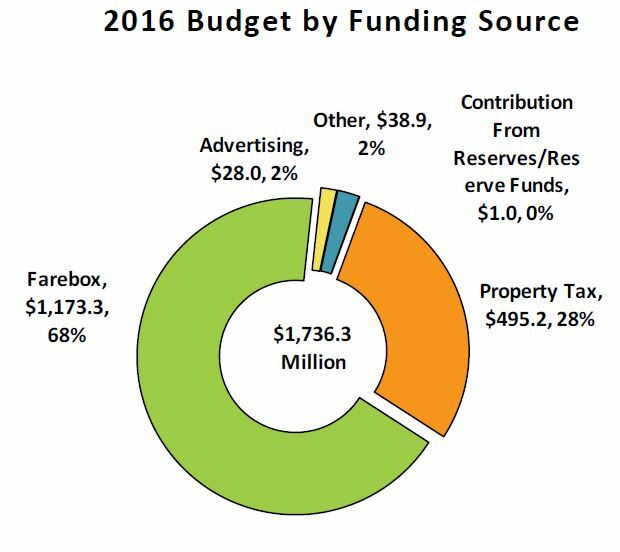 On the flipside, why is there no Property Tax line for 2024? If it’s such a rosy picture, part of the SRT demolition could be moved forward to 2024 to make these numbers less volatile. Steve: Until further reports on the cost of various projects come out in the next few months, City Finance is in no position to pre-announce information about the projects or the financial implications for the City. Next, if the SRT Life Extension was 80.6% of budgeted for 2015, is there a chance that this is over allotted? A similar reduction would be a $25M savings over the cycle and allow for a few more bus purchases. Hello Steve: Is it true the next gen hybrids won’t be rebuilt and retired early? I noticed some 10 and 11 series are being rebuilt right now. Do you know if TTC is buying Nova buses from now on? Steve: Please refer to my article about proposed changes in the bus fleet plans. Some changes are subject to approval of the TTC’s capital financing requirements by the City as part of the budget process now underway. As for Nova Bus, they could bid on the next contract for buses, but who would get the award I don’t know. I’m not sure how AODA differs from the ADA in the US. The law and regulations are written in a much fuzzier way. In the US, paratransit has to be present whereever the fixed-route system is present, for people who cannot use the fixed route system. (7) people on kidney dialysis, and a few other conditions which cause them to be able to walk/roll only *very very short* distances. Most likely the buses & subway trains themselves are accessible; this always seems to happen first. If the situation is as I expect it is, then it would be worthwhile for TTC to prioritize the capital construction which allows them to reduce WheelTrans usage. Category 6 is completely unavoidable, as is some of category 5, but all the others can be fixed. Steve: It’s a tad more complex than your description. There is a combination of provincially mandated policies plus local political attitudes. For example, ambulatory dialysis patients were cut from Wheel-Trans eligibility during the Ford-Stintz era as a cost saving measure, with their transportation covered through alternative means that had no draw on the city budget. It was a despicable act born of the triumph of “protecting the taxpayer”, and the sense that some people were not “disabled enough” to warrant service on the public’s dime. There have been ongoing debates about eligibility and a wrestling match between those who feel the system is unduly difficult to navigate for approval, and those who claim WT is used by a bunch of freeloaders who must be stopped at all costs. This is not unlike the general debate about “what transit should do” but with a much nastier effect directed at a group for whom denial of service is much more devastating than how often the Queen car shows up. The ability to get to a stop in bad weather generally does not enter into the decision, and this remains a matter of contention. Don’t forget, by the way, that unplowed sidewalks affect users of the conventional system too. In Toronto, the discrimination is against those living in the “old” city where snow-clearing is not provided as a municipal service. Fascinating. In the US, we have court rulings which determine that this is relevant. This has led to the interesting situation that the transit authority is required to provide paratransit for people solely because the city doesn’t plow the sidewalks, but has no ability to force the city to plow the sidewalks (because, unlike in Toronto, the transit authority is often independent from the city). The city then blames the individual homeowners who the city has ordered to plow the sidewalks according to 19th century ordinances, but the city never actually does anything to make it happen. The insanity of municipal snow-clearing policies is a whole ‘nother topic of discussion and really should be rationalized. It’s just as crazy, or even crazier, in many parts of the US as it is in Toronto. In the US kidney dialysis patients have proven to be a spectacularly large portion of most transit agency paratransit budgets. It seems unreasonable to just about everyone for this to be paid for this out of sales tax, which is the usual source of transit agency funding in the US. There has been a concerted effort to get Medicaid, Medicare, the VA, and the other federal medical programs, to reimburse the transit agencies for the trips to the hospital and doctors’ offices at least, since those medical programs are funded out of income tax. It would be simpler to do this in Canada with a much simpler medical funding system. In Ottawa, replacing the Central Transitway with the Confederation Line LRT is expected to actually reduce operating costs by $18M annually as LRT is cheaper to operate than buses at high volumes. Unless the situation in Toronto is radically different, shouldn’t the Eglinton and Finch LRT lines actually reduce budget pressures on Toronto? Steve: Things are a bit more complicated than simply the relative cost of LRT and BRT at various demand levels. First off, we expect, but don’t know for sure, that Queen’s Park will pick up the tab for operating “their” LRT lines. but in return will almost certainly want some of the fare revenue. Ridership will be higher, especially on Eglinton, and so there is an economy of scale in carrying passengers, but there is an offsetting cost in operating a more expensive infrastructure. The situation is not as marked on Finch, but then the projected demands are much lower too. A related issue will be just what is considered to be an “operating” cost. The tunnel contract on Eglinton is a conventional one in which a builder builds something, and the buyer then owns it, just as with TTC projects such as the TYSSE to Vaughan. However, that’s just the raw tunnel structure. The stations, all of their fittings, and major systems installed along the line (power, signals, etc.) are the responsibility of a consortium which has a long term (30 yr I believe) contract to operate and maintain “their” part of the infrastructure. Some of their cost base will be recovery of the money invested to build “their” part of the line, and this could well show up as an “operating cost” even though it is more correctly equivalent to a capital lease. Whether Toronto, as a City and its transit budget, come out “ahead” once the LRT lines open is as much a question of accounting as it is a factor of relative costs, all in, of any particular mode. Even worse, given the general opacity of Metrolinx financial dealings, notably with PPPs where “commercial confidentiality” masks a great deal of what is happening, we probably won’t know the breakdown between true operating expenses and recovery of capital costs. TTC will be operating the lines under contract, but vehicle and infrastructure maintenance will lie with the private “partners”. In the short term, the cost of the LRT will probably look rather good because none of the infrastructure will have worn out. In time, there will be a need for new track, signals, vehicles, escalators, and so on, but by that time, the “asset” will be back in public hands and renewal funding will be on the public dime.